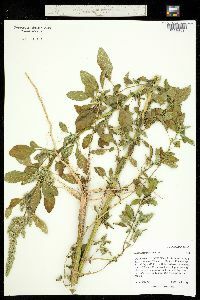 Plants densely to moderately pubescent, especially distal parts of stem and branches. 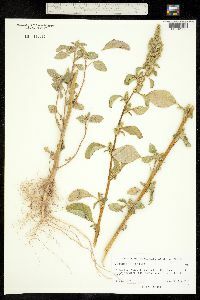 Stems erect, reddish near base, branched in distal part to simple 0.2-1.5(-2) m; underdeveloped or damaged plants rarely ascending to nearly prostrate. Leaves: petiole 1/2 to equaling blade; blade ovate to rhombic-ovate, 2-15 × 1-7 cm, base cuneate to rounded-cuneate, margins entire, plane or slightly undulate, apex acute, obtuse, or slightly emarginate, with terminal mucro. Inflorescences terminal and axillary, erect or reflexed at tip, green or silvery green, often with reddish or yellowish tint, branched, leafless at least distally, usually short and thick. Bracts lanceolate to subulate, (2.5-)3.5-5(-6) mm, exceeding tepals, apex acuminate with excurrent midrib. Pistillate flowers: tepals 5, spatulate-obovate, lanceolate-spatulate, not clawed, subequal or unequal, (2-)2.5-3.5(-4) mm, membranaceous, apex emarginate or obtuse, with mucro; style branches erect or slightly spreading,; stigmas 3. Staminate flowers few at tips of inflorescences; tepals 5; stamens (3-)4-5. Utricles broadly obovoid to broadly elliptic, 1.5-2.5 mm, shorter than or subequal to tepals, smooth or slightly rugose, especially near base and in distal part, dehiscence regularly circumscissile. Seeds black to dark reddish brown, lenticular to subglobose-lenticular, 1-1.3 mm, smooth, shiny. Flowering summer-fall. Banks of rivers, lakes, and streams, disturbed habitats, agricultural fields, railroads, roadsides, waste areas; 0-2500 m; St. Pierre and Miquelon; Alta., B.C., Man., N.B., Nfld. and Labr., N.W.T., N.S., Nunavut, Ont., P.E.I., Que., Sask. ; Ala., Alaska, Ariz., Ark., Calif., Colo., Conn., Del., D.C., Fla., Ga., Idaho, Ill., Ind., Iowa, Kans., Ky., La., Maine, Md., Mass., Mich., Minn., Miss., Mo., Mont., Nebr., Nev., N.H., N.J., N.Mex., N.Y., N.C., N.Dak., Ohio, Okla., Oreg., Pa., R.I., S.C., S.Dak., Tenn., Tex., Utah, Vt., Va., Wash., W.Va., Wis., Wyo. ; introduced and naturalized nearly worldwide. 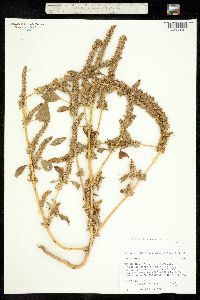 Amaranthus retroflexus, native to central and eastern North America, is a successful invasive species and has effectively colonized a wide range of habitats on all inhabited continents. Its variability is extremely wide; usually the species is easily recognized and its identification causes no specific problems. Infraspecific entities described within A. retroflexus are mostly ecologic variants of little or no taxonomic value. Two varieties are more easily recognized: the common var. 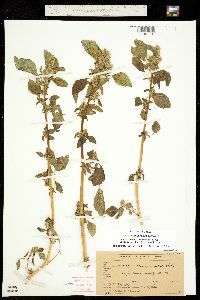 retroflexus, with bracts about 1.5-2 times as long as tepals, and a more rare var. 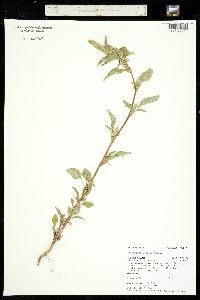 delilei (Richter & Loret) Thellung (= A. delilei Richter & Loret), with bracts 1-1.5 times as long as tepals. 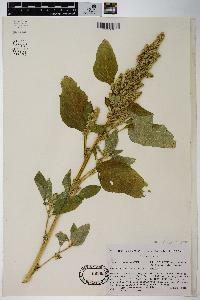 Occasional forms morphologically intermediate between Amaranthus retroflexus and taxa of the A. hybridus aggregate (e.g., A. powellii and A. hybridus, in the strict sense) are known both in the Americas and the Old World. 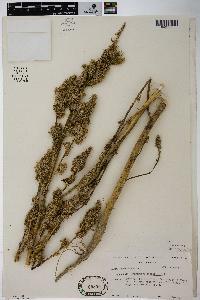 Usually such plants are treated as hybrids; in many cases they are probably just extremes of the natural variability of A. retroflexus. Putative hybrids of A. retroflexus were described from Europe as A. ×ozanonii Thellung (A. hybridus × A. retroflexus) and A. 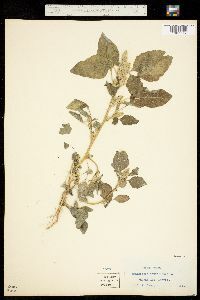 ×soproniensis Priszter & Karpáti (A. powellii × A. retroflexus) (see A. Thellung 1914-1919; S. Priszter 1958; P. Aellen 1959; F. Grüll and S. Priszter 1973). 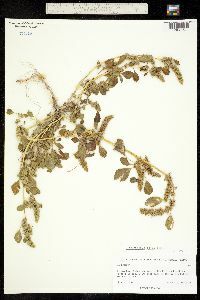 Like the preceding species this one is widely distributed throughout the state as a weed in cultivated fields and waste places and along roadsides and railroads. It also prefers rich soils and is a too common weed. 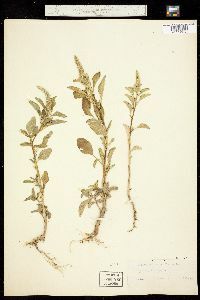 Monoecious; stem stout, erect, usually branched, to 2 m; plant scurfy-villous in and for some distance below the infl; lvs long-petioled, ovate or rhombic-ovate, usually hairy beneath at least along the veins, to 10( 15) cm in well developed plants; principal infl a terminal panicle of several or many short, densely crowded, obtuse spike-like thyrses, the whole 5-20 cm; similar but smaller panicles produced from the upper axils; bracts rigid, subulate, 4-8 mm, much surpassing the cal; sep 5, those of the pistillate fls oblong-lanceolate, slightly outcurved above, rounded or truncate or emarginate at the tip, and often minutely mucronate, with simple midvein, at maturity 3-4 mm and much-surpassing the fr; stamens 5; style-branches fairly long, erect or slightly recurved; fr compressed, 1.5-2 mm, circumscissile at the middle, the upper part rugulose; seed round-obovate, 1-1.2 mm; 2n=34. 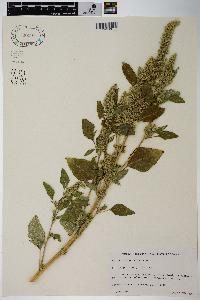 Native of tropical Amer., now a common weed throughout most of the U.S. and also in the Old World.